Perfect scrambled eggs with ham 5 out of 5 based on 1 ratings. 1 user reviews. Along with simple toast, butter and a coffee, this is the perfect traditional Irish or English breakfast. You can also cook it along with French toast or Homemade strawberry jam for brunch. My dear darling is Irish so he showed me how to make perfect scrambled eggs in 10 minutes. Just cook the beaten eggs in a small pot over a very low heat, mixing constantly with a whisk until the mixture is starting to get thick. I advise you to turn off the heat once the eggs are almost cooked (but still a bit liquid), and finish mixing until they reach the desired firmness. 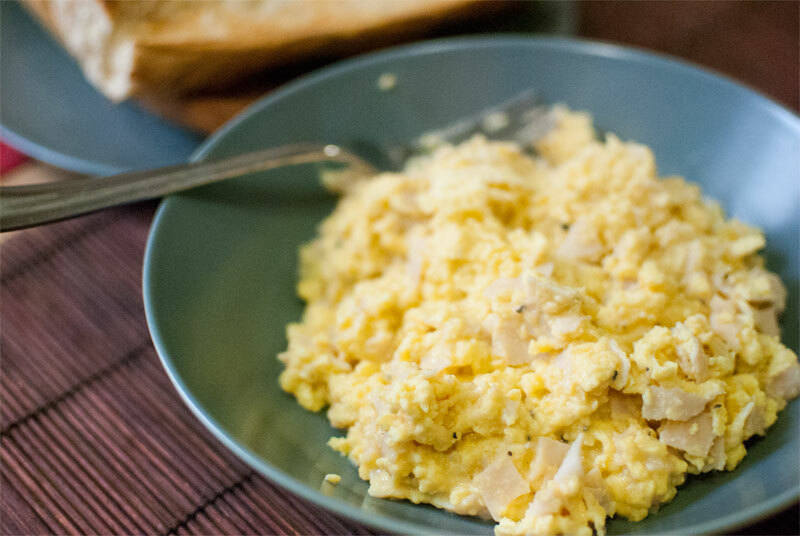 I personally like runny scrambled eggs, but some people prefer to have them very cooked, so just do it as you like. 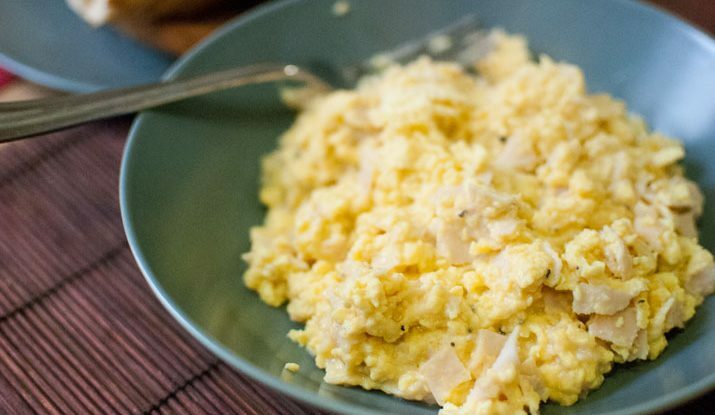 pour a drop of milk or cream, to make the scrambled eggs softer and creamier. grate a little bit of nutmeg into the preparation bowl, it will give a nice addictive after-taste to the eggs. incorporate a slice of York ham to the eggs, its soft taste makes for a perfect combination. 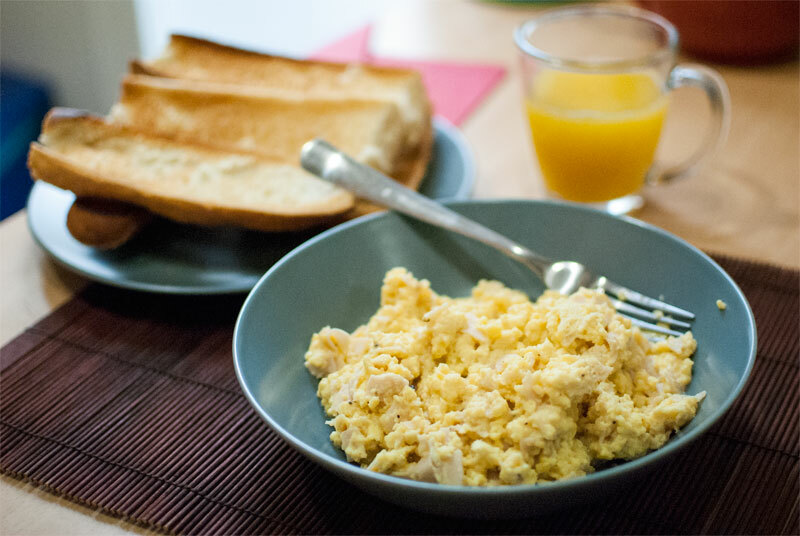 This advice is totally personal, there are as many ways of preparing the perfect scrambled eggs as people on Earth. And you, how do you like to cook your eggs in the morning? Fresh grated nutmeg, salt, pepper, grated coriander seeds etc. Chop the slices of ham in small pieces. Beat the eggs in a big bowl with a whisk and incorporate the other ingredients: milk, spices, seasoning and ham. Pour the preparation in a pot and start heating over very low heat, mixing gently with the whisk all the time. Mix constantly with the whisk until the mixture is starting to get thick. Turn off the heat once the eggs are starting to get firm (but still a bit liquid), and finish mixing away from the heat until they reach the desired consistency, from runny to cooked according to your taste. The pot should be hot enough to finish the cooking. Pour the eggs in a dish and eat them hot along with hot toast and butter.